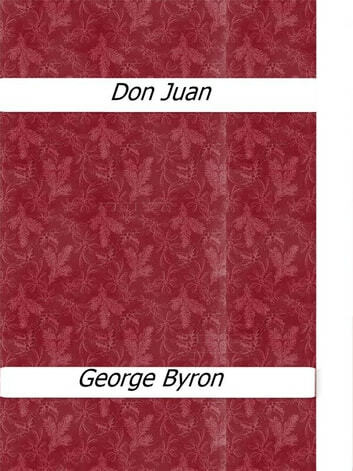 Don Juan is a satiric poem by Lord Byron, based on the legend of Don Juan. The story, told in seventeen cantos, begins with the birth of Don Juan. As a young man he is precocious sexually, and has an affair with a friend of his mother. The husband finds out, and Don Juan is sent away to Cadiz. On the way, he is shipwrecked, survives, and meets the daughter of a pirate, whose men sell Don Juan as a slave. A young woman who is a member of a Sultan’s harem, sees that this slave is purchased. She disguises him as a girl and sneaks him into her chambers. Don Juan escapes, joins the Russian army, and rescues a Muslim girl named Leila. Don Juan meets Catherine the Great, who asks him to join her court. Don Juan becomes sick, is sent to England, where he finds someone to watch over the young girl, Leila. Next, a few adventures involving the artistocracy of Britain ensue.